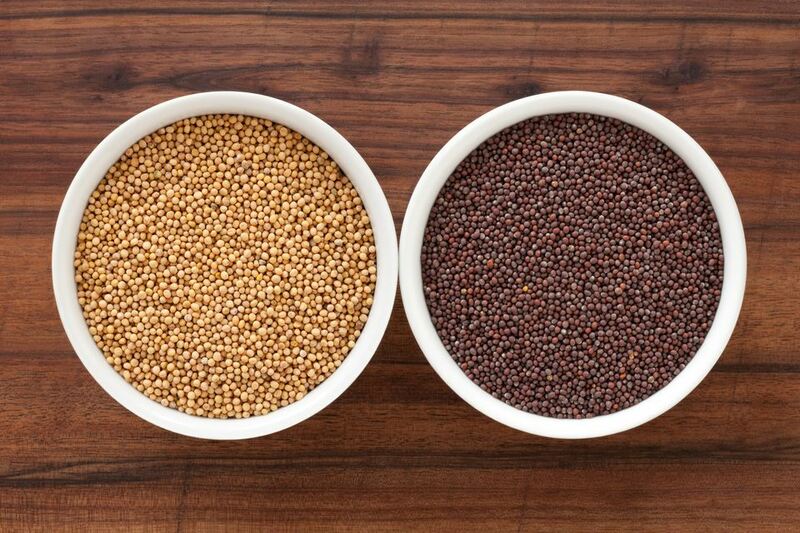 The mustard seeds used in Indian cooking are tiny and black or dark brown in color. The seeds have a faint spicy smell much like curry leaves. They taste just like mustard in its paste form. Tadka or tempering is a cooking method in which cooking oil is heated until very hot and whole spices are added to it and fried. This oil and spice mix is then added as a final touch or garnish to the dish. In Indian cooking, Rai/Sarson is often part of the Tadka in a dish. In comparison, Rai/Sarson is used more in South Indian than in North Indian cooking. In the South, it is typically combined with green chilies and curry leaves in a tadka. It is sometimes used in paste form, for example in Eastern Indian dishes like Deemer Patudi or fish curries. Mustard seeds are from the mustard plant, which belongs to the Cruciferous plant family. Other vegetables belonging to this family are cauliflower, broccoli, Brussels sprouts, and cabbage. Though small, the mustard seed is famous. It is referred to in Christian teachings, Islam, Hinduism, and Buddhism. Sanskrit writings from 5,000 years ago mention mustard seeds. Mustard seeds were used medicinally in history and today we know them to be a great source of omega-3 fatty acids, iron, calcium, zinc, manganese, and magnesium. Some research suggests they contain compounds that help fight cancer. Mustard poultices were (and still are) used to relieve the congestion resulting from a cold and cough. Got a stiff back or sore aching muscles? Soak yourself in a warm bath to which mustard powder has been added. You know how jam, pickle, spice jars smell of the stuff that was in them even after being washed? Get rid of this smell by putting some mustard paste in the jar and filling with warm water. Shake well and pour out. Now wash the jar again and the smell will be gone.